We were up without hurry and enjoyed our breakfast of Apple oatmeal, cooked gently on our butane stove. We had camped in easy reach to an old road we hoped would lead to Diamand Farm. It did! What a great thruhiker find! It’s a family run egg and poultry farm in its second generation. How different the Diamands are from my family of ten siblings who have mostly moved far away from our Ohio birthplace, except for my older brother who owns the house where my 90-year old mom lives and has his own house in the right after next door! 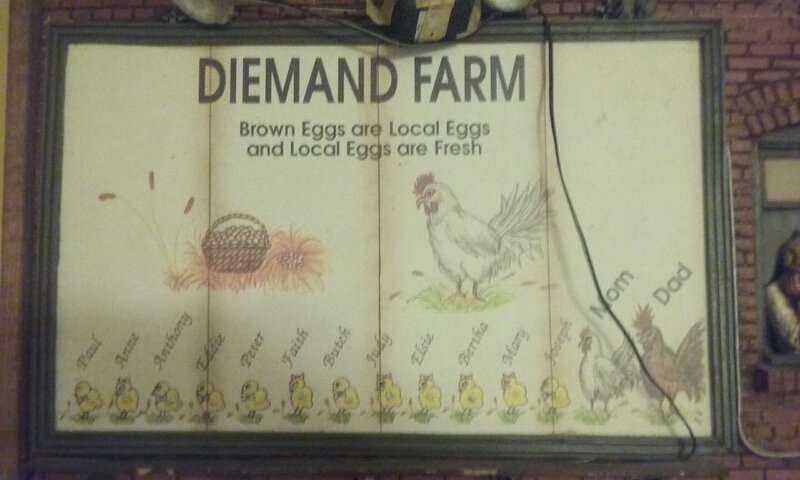 We were at the Diamand Farm Store just about an hour, but the visit filled my belly and my heart with a delightful trail community experience! We returned to the trail in the same easy route up an old road and resumed our trek south through the Wendell State Forest. 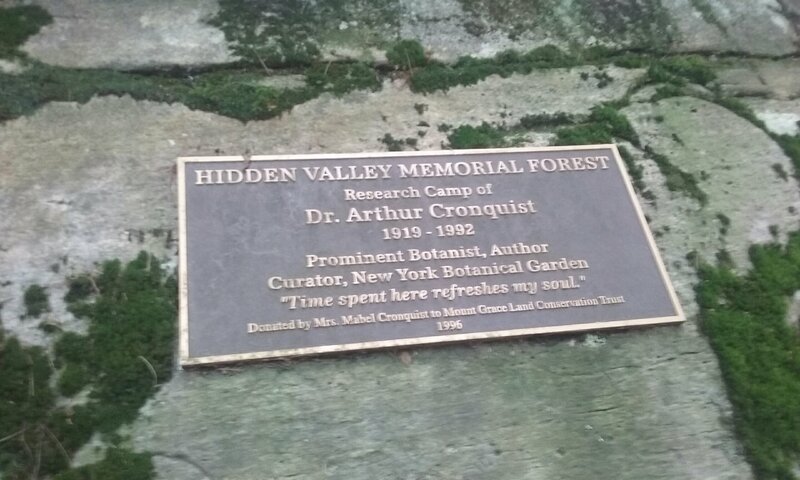 We came to a plaque dedicated to Dr. Arthur Cronquist, a botanist of the New York Botanical Garden. He had used the surrounding 66 acres of forest for his research camp. Now, it is one of the many privately owned properties that the trail traverses. I’m fascinated with the various partnerships that have cooperated to create this thread of greenspace! 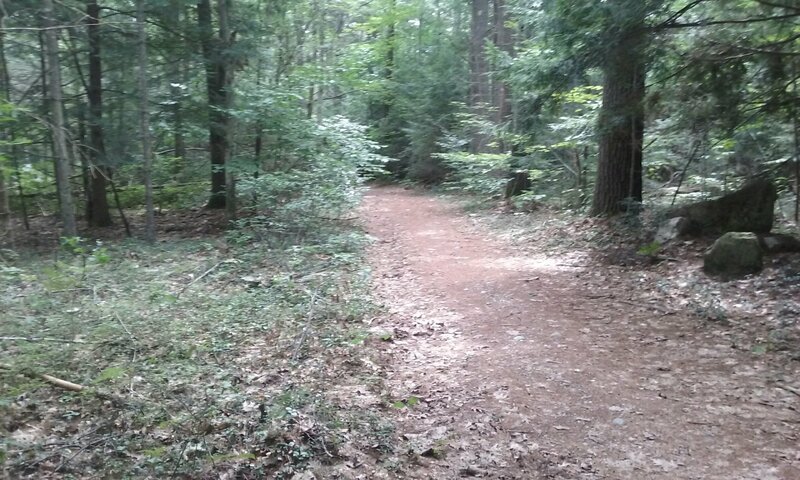 On the southern edge of Wendell State Forest, another half mile south, we reached one of the eight designated camps in the entire 207mile length of the New England Trail. 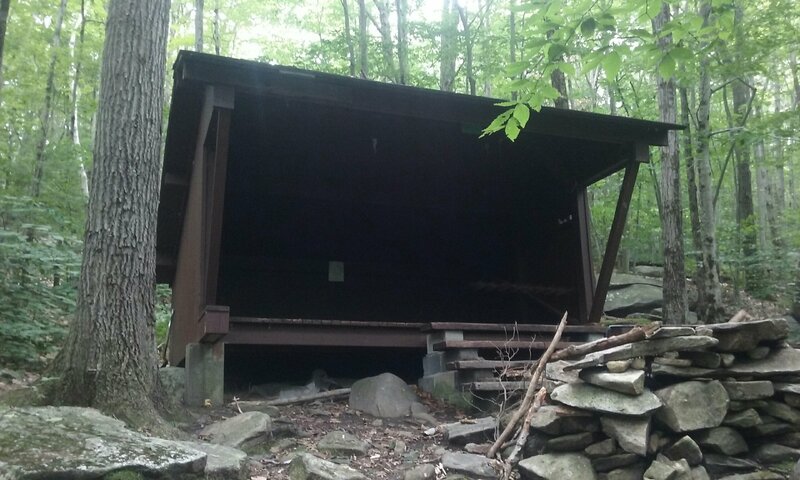 This one, the Wendell State Forest Shelter, is similar to Appalachian Trail shelters, a three-sided roofed wooden platform. It looked deep enough to keep out rain. We ate our late morning snack of sweet potatoes as a family of three kids and a mom passed by the shelter, pointing at it with curiousity. Without a word to us, they continued north on the trail, probably to the scenic waterfalls we had just passed. Surprisingly, just a few hundred yards south of the shelter, the trail reached a parking lot, picnic area, and swimming beach! So close to the shelter! Our afternoon walk took us through a beautiful pine forest with an easy grade following the side road called Swamp Road. 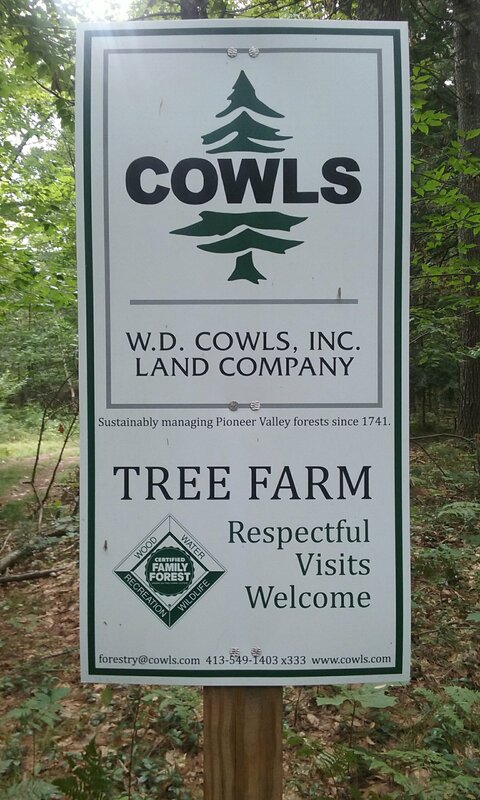 We came to a sign for the COWLS Sustainable Tree Farm – Respectful visits welcome. We were just about to enter the tree farm respectfully, when I suggested we stop there and take a lunch break. As we settled down on John’s mat, I noticed a white glazed tree off in another direction. We had been on the brink of another misdirection! Saved by lunch! On the correct route again, we continued through another stretch of forest around the tree farm to Lake Wyola, a summer cottage haven. We decided to take a dip in our clothes, me in my sports bra and skort. The water felt good – and clean. Hot mashed potatoes felt even better after getting out chilled! On our way again, for our evening walk, we left the lake area for our next stretch, a road walk that took us to a woods road and high up a mountain on “Rockwell Hill Road” and our resting spot for the night. Ducking back into the forest out of sight of the trail, we set up our tiny tent, cooked dinner, and hung our food bag. Now, the trail feels like home! I am loving reading your posts! I can imagine your walk, remembering the many times we walked, and remembering the delicious foods you prepared for us. Hugs to John.